Following my last post about my new website and branding, I thought I'd post about my new business cards from Moo. I've used Moo for my business cards for ages, but lately I've found that their picture cards are a little too common for my liking. I've also turned into a bit of a stationery snob, so wanted something a little more luxury. I'm actually planning on getting some proper pressed cards made soon, but with London Fashion Week coming up I thought I better get some new cards, not least because I ran out of my old ones some time ago! Moo are always pretty quick at their turnarounds, so I thought I would take a look on their website first. As luck would have it, they'd introduced a new range, called 'Luxe'. This was exactly what I was looking for. 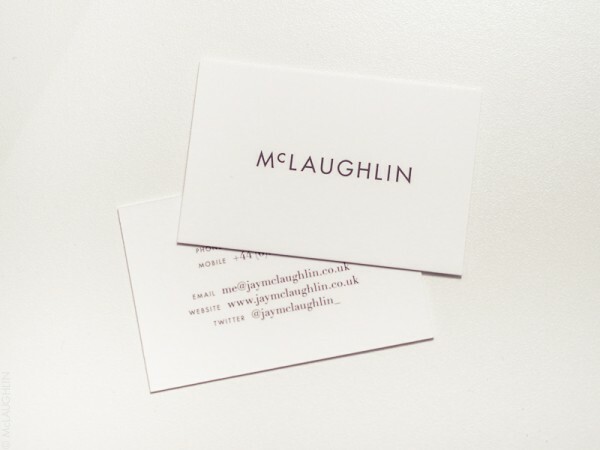 A 600gsm Mohawk Superfine card that would feel nice in the hand as well as being nice to look at. When I finally got my hands on them, to say I was impressed was an understatement! I always like the 'Yay!' stickers on the outside of the packaging, but what I was greeted with as I opened it up was a really pleasant surprise. From the simple and elegant 'Luxe' on the top flap, to the purple ribbon complete with it's own seal, everything was designed to make the product feel not just expensive, but special! Another nice little touch was the little message on the top card. Mine was a quote from Jerry Maguire that said 'You had me from hello'. I like that! The cards themselves are exactly what I ordered. They look and feel a cut above. I can't wait to give them to people! For more information on Moo's 'Luxe' range, visit their website.